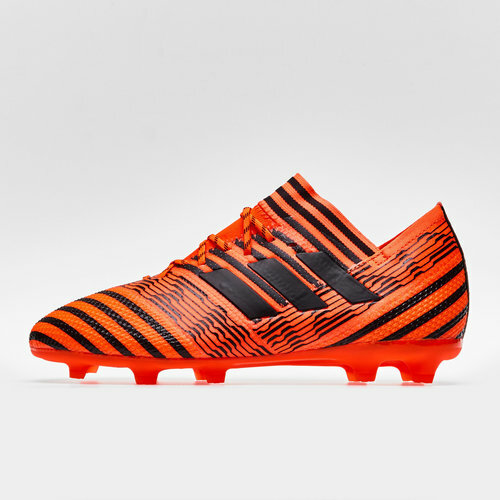 Designed for devastating agility become a super natural force on the field and shock every opponent on the way with the adidas Nemeziz 17.1 FG Kids Football Boots in Solar Orange, Core Black and Solar Red. These kids boots which have been inspired by sports tape which wraps around an athlete for support and performance, a design that will take the game to another level. The next generation will experience more goals and assists and become the devastating athlete they've always wanted to be. The Torsion frame will get them on the front foot allowing pace to become a game decided weapon. This model comes with laces if they prefer the comfort of tightening boots to the desired fit.